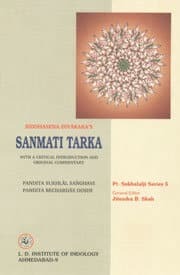 Sanmati Tarka or The Logic of the True Doctrine is classic philosophical work on logic. It was originally written by Siddhasēna Divākara in Sanskrit, then translated to Gujarati and to English. Siddhasēna Divākara was a fifth century CE monk, who was also known “Lamp-maker”, because of his great works on philosophy and epistemology in the early years of the Jain orders. In Sanmati Tarka he puts forward the theory of Anekantavada or many-sidedness. The basic idea of Anekantavada has its roots in the teachings of Mahāvīra, and it refers to the principles of pluralism and multiplicity of viewpoints, or vantage points, the notion that reality is perceived differently from diverse points of view, and that no single point of view is the complete truth, yet taken together they comprise the complete truth. A classic philosophical work on logic. It was originally written by Siddhasēna Divākara in Sanskrit, then translated to Gujarati and to English.